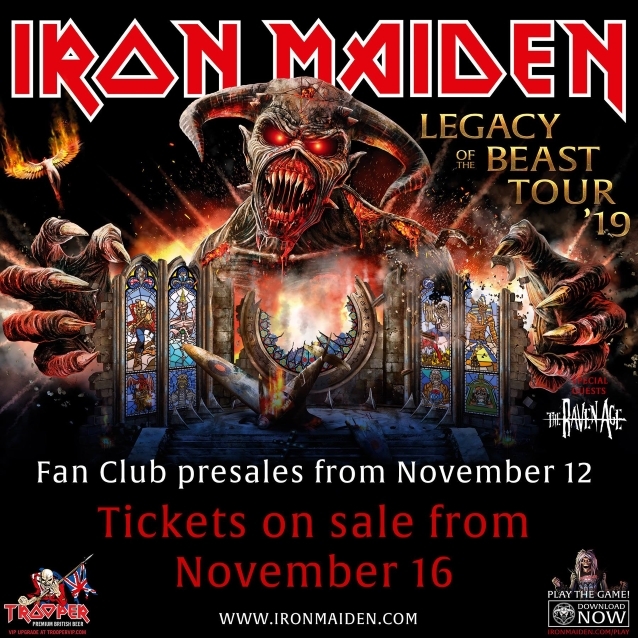 IRON MAIDEN will bring the "Legacy Of The Beast" tour to North America in 2019 for an extensive series of arena and amphitheater shows produced by Live Nation, including a first-ever headline appearance at the Banc of California Stadium in Los Angeles. The tour will cover a total of 33 cities right across the U.S.A. and Canada, including Portland, Oregon where they haven't played since 1987 on the "Somewhere In Time" tour, Hartford, Connecticut where they last played in 2005, and many other places not visited since the "Maiden England" 2012-2013 tour. The full list of dates is below. Tickets will go on sale to the general public beginning Friday, November 16 at 10 a.m. local time at LiveNation.com. As always, there will be an exclusive pre-sale for IRON MAIDEN fan-club members. 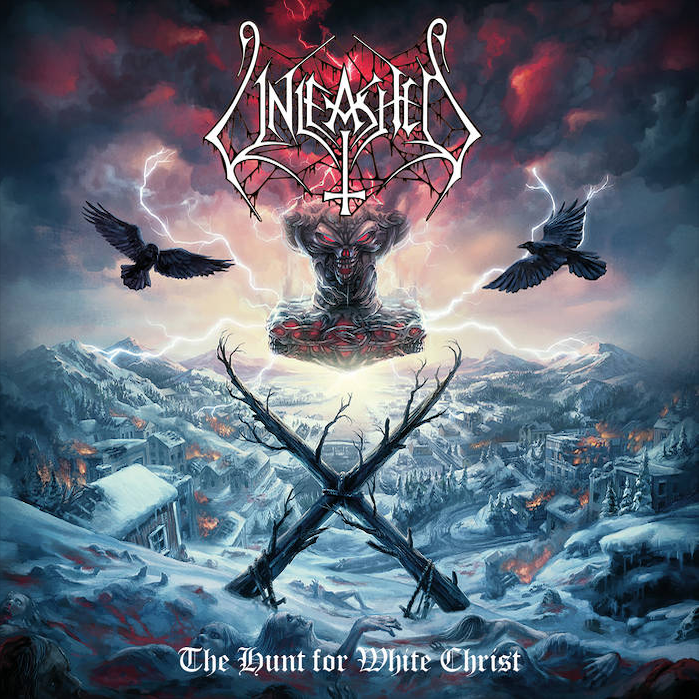 The band's triumphant first leg of the "Legacy Of The Beast" tour opened in Europe earlier this year to outstanding critical acclaim, not just by the 750,000-plus fans who came to see the show but right across national press and rock media, including The Times (UK) newspaper calling it "an extraordinary show filled with world class theatrics… a masterclass in performance and staging." 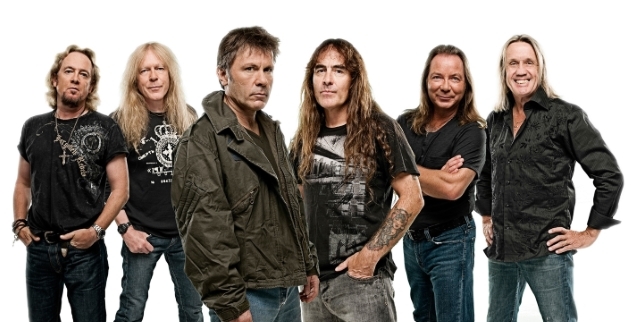 MAIDEN vocalist Bruce Dickinson comments: "We're excited to return to North America and share the 'Legacy Of The Beast' tour with all our friends there! We're immensely proud of this show and we've had great reactions from the many fans who came to see us in Europe earlier this year. The production is based on our mobile game 'The Legacy Of The Beast' which basically takes various incarnations of Eddie into many different MAIDEN worlds. This inspired us to put together a stage show to take our fans through different worlds and experiences set to appropriate songs. It is not that easy designing different worlds on stage and we put a huge amount of work into this to make it work and the end result we feel is our most spectacular and certainly the most complex show to date. We've got all kinds of crazy things going on, including a replica Spitfire plane dominating the stage during 'Aces High', tons of pyro, a giant Icarus, muskets, claymores and some truly marvellous flame-throwers which I have a hell of a lot of fun with, as you will see! And, of course, we have Eddie, as you've never seen him before, and absolutely loads of other surprises. I've had the time of my life playing with all these magnificent props on stage, it's been fantastic, we can't wait to bring this show to you!" Steve Harris, bassist and founder member adds: "We gave a lot of thought to the set list for this tour as the songs needed to follow the narrative of the changing worlds of the stage show. We feel we ended up with a very strong and well balanced set mixing songs we haven't played in many years, like 'Flight Of Icarus', 'Sign Of The Cross' and 'The Clansman' with songs we know the fans want to hear like 'The Trooper', '2 Minutes To Midnight', 'The Number Of The Beast', 'Fear Of The Dark', 'Run To The Hills', 'Hallowed Be Thy Name' and others, reflecting the journey through the different themes of the show. The whole band is really enjoying this tour and we are really looking forward to seeing everybody again!" Support on the 2019 tour comes from THE RAVEN AGE. Additionally, FOZZY will be guests for the Banc of California Stadium show in Los Angeles. No further cities will be added to this touring schedule. For the 2019 shows, IRON MAIDEN will, in conjunction with the promoters, be implementing a partial digital ticketing system in as many venues as possible. This technology, being used by the NFL amongst others, is a progression of the paperless system that MAIDEN have been successfully using since 2010 and has worked well in lessening ticket scalping and the drain of prime tickets into the Secondary market. Fans in the USA and Canada will once again be able to enjoy a Trooper VIP Upgrade package allowing early access to the venue, a pile of Trooper goodies, Trooper beers, food and a designated area to meet with other fans, plus the opportunity to win some great prizes. Packages will be available from IronMaiden.com, priced at $220 ($290 CAD for Canadian shows), with a 10% discount for IRON MAIDEN fan-club members.